For other uses, see Agar (disambiguation). Agar (pronounced /ˈeɪɡɑːr/, sometimes /ˈɑːɡər/) or agar-agar is a jelly-like substance, obtained from red algae. Agar is a mixture of two components: the linear polysaccharide agarose, and a heterogeneous mixture of smaller molecules called agaropectin. It forms the supporting structure in the cell walls of certain species of algae, and is released on boiling. These algae are known as agarophytes, and belong to the Rhodophyta (red algae) phylum. Agar has been used as an ingredient in desserts throughout Asia, and also as a solid substrate to contain culture media for microbiological work. Agar can be used as a laxative, an appetite suppressant, a vegetarian substitute for gelatin, a thickener for soups, in fruit preserves, ice cream, and other desserts, as a clarifying agent in brewing, and for sizing paper and fabrics. The gelling agent in agar is an unbranched polysaccharide obtained from the cell walls of some species of red algae, primarily from tengusa (Gelidiaceae) and ogonori (Gracilaria). For commercial purposes, it is derived primarily from ogonori. In chemical terms, agar is a polymer made up of subunits of the sugar galactose. Agar may have been discovered in Japan in 1658 by Mino Tarōzaemon (美濃 太郎左衛門), an innkeeper in current Fushimi-ku, Kyoto who, according to legend, was said to have discarded surplus seaweed soup and noticed that it gelled later after a winter night's freezing. Over the following centuries, agar became a common gelling agent in several Southeast Asian cuisines. Agar was first subjected to chemical analysis in 1859 by the French chemist Anselme Payen, who had obtained agar from the marine algae Gelidium corneum. Beginning in the late 19th century, agar began to be used heavily as a solid medium for growing various microbes. Agar was first described for use in microbiology in 1882 by the German microbiologist Walther Hesse, an assistant working in Robert Koch's laboratory, on the suggestion of his wife Fannie Hesse. Agar quickly supplanted gelatin as the base of microbiological media, due to its higher melting temperature, allowing microbes to be grown at higher temperatures without the media liquefying. With its newfound use in microbiology, agar production quickly increased. This production centered on Japan, which produced most of the world's agar until World War II. However, with the outbreak of World War II, many nations were forced to establish domestic agar industries in order to continue microbiological research. Around the time of World War II, approximately 2,500 tons of agar were produced annually. By the mid-1970s, production worldwide had increased dramatically to approximately 10,000 tons each year. Since then, production of agar has fluctuated due to unstable and sometimes over-utilized seaweed populations. The word "agar" comes from agar-agar, the Malay name for red algae (Gigartina, Gracilaria) from which the jelly is produced. It is also known as Kanten (Japanese: 寒天) (from the phrase kan-zarashi tokoroten (寒晒心太) or “cold-exposed agar”), Japanese isinglass, Ceylon moss or Jaffna moss. Gracilaria lichenoides is specifically referred to as agal-agal or Ceylon agar. Agar consists of a mixture of two polysaccharides: agarose and agaropectin, with agarose making up about 70% of the mixture. Agarose is a linear polymer, made up of repeating units of agarobiose, a disaccharide made up of D-galactose and 3,6-anhydro-L-galactopyranose. Agaropectin is a heterogeneous mixture of smaller molecules that occur in lesser amounts, and is made up of alternating units of D-galactose and L-galactose heavily modified with acidic side-groups, such as sulfate and pyruvate. Agar exhibits hysteresis, melting at 85 °C (358 K, 185 °F) and solidifying from 32–40 °C (305–313 K, 90–104 °F). This property lends a suitable balance between easy melting and good gel stability at relatively high temperatures. Since many scientific applications require incubation at temperatures close to human body temperature (37 °C), agar is more appropriate than other solidifying agents that melt at this temperature, such as gelatin. Agar-agar is a natural vegetable gelatin counterpart. White and semi-translucent, it is sold in packages as washed and dried strips or in powdered form. It can be used to make jellies, puddings, and custards. For making jelly, it is boiled in water until the solids dissolve. Sweetener, flavouring, colouring, fruit or vegetables are then added and the liquid is poured into molds to be served as desserts and vegetable aspics, or incorporated with other desserts, such as a jelly layer in a cake. Agar-agar is approximately 80% fiber, so it can serve as an intestinal regulator. Its bulking quality has been behind fad diets in Asia, for example the kanten (the Japanese word for agar-agar) diet. Once ingested, kanten triples in size and absorbs water. This results in the consumers feeling fuller. This diet has recently received some press coverage in the United States as well. The diet has shown promise in obesity studies. One use of agar in Japanese cuisine (Wagashi) is anmitsu, a dessert made of small cubes of agar jelly and served in a bowl with various fruits or other ingredients. It is also the main ingredient in mizu yōkan, another popular Japanese food. In Philippine cuisine, it is used to make the jelly bars in the various gulaman refreshments or desserts such as sago gulaman, buko pandan, agar flan, halo-halo, and the black and red gulaman used in various fruit salads. In Vietnamese cuisine, jellies made of flavored layers of agar agar, called thạch, are a popular dessert, and are often made in ornate molds for special occasions. In Indian cuisine, agar agar is known as "China grass" and is used for making desserts. 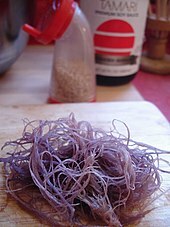 In Burmese cuisine, a sweet jelly known as kyauk kyaw [tɕaʊʔtɕɔ́] is made from agar. In Russia, it is used in addition or as a replacement to pectin in jams and marmalades, as a substitute to gelatin for its superior gelling properties, and as a strengthening ingredient in souffles and custards. Another use of agar-agar is in ptich'ye moloko (bird's milk), a rich jellified custard (or soft meringue) used as a cake filling or chocolate-glazed as individual sweets. Agar-agar may also be used as the gelling agent in gel clarification, a culinary technique used to clarify stocks, sauces, and other liquids. Agar-agar is an allowed nonorganic/nonsynthetic additive used as a thickener, gelling agent, texturizer, moisturizer, emulsifier, flavor enhancer, and absorbent in certified organic foods. An agar plate or Petri dish is used to provide a growth medium using a mix of agar and other nutrients in which microorganisms, including bacteria and fungi, can be cultured and observed under the microscope. Agar is indigestible for many organisms so that microbial growth does not affect the gel used and it remains stable. Agar is typically sold commercially as a powder that can be mixed with water and prepared similarly to gelatin before use as a growth medium. Other ingredients are added to the agar to meet the nutritional needs of the microbes. Many specific formulations are available, because some microbes prefer certain environmental conditions over others. Agar is often dispensed using a sterile media dispenser. As a gel, an agar or agarose medium is porous and therefore can be used to measure microorganism motility and mobility. The gel's porosity is directly related to the concentration of agarose in the medium, so various levels of effective viscosity (from the cell's "point of view") can be selected, depending on the experimental objectives. A common identification assay involves culturing a sample of the organism deep within a block of nutrient agar. Cells will attempt to grow within the gel structure. Motile species will be able to migrate, albeit slowly, throughout the gel and infiltration rates can then be visualized, whereas non-motile species will show growth only along the now-empty path introduced by the invasive initial sample deposition. Another setup commonly used for measuring chemotaxis and chemokinesis utilizes the under-agarose cell migration assay, whereby a layer of agarose gel is placed between a cell population and a chemoattractant. As a concentration gradient develops from the diffusion of the chemoattractant into the gel, various cell populations requiring different stimulation levels to migrate can then be visualized over time using microphotography as they tunnel upward through the gel against gravity along the gradient. 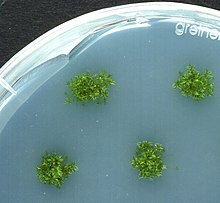 Physcomitrella patens plants growing axenically in vitro on agar plates (Petri dish, 9 cm diameter). Research grade agar is used extensively in plant biology as it is supplemented with a nutrient and vitamin mixture that allows for seedling germination in Petri dishes under sterile conditions (given that the seeds are sterilized as well). Nutrient and vitamin supplementation for Arabidopsis thaliana is standard across most experimental conditions. Murashige & Skoog (MS) nutrient mix and Gamborg's B5 vitamin mix in general are used. A 1.0% agar/0.44% MS+vitamin dH2O solution is suitable for growth media between normal growth temps. When using agar, within any growth medium, it is important to know that the solidification of the agar is pH-dependent. The optimal range for solidification is between 5.4-5.7. Usually, the application of KOH is needed to increase the pH to this range. A general guideline is about 600 µl 0.1M KOH per 250 ml GM. This entire mixture can be sterilized using the liquid cycle of an autoclave. This medium nicely lends itself to the application of specific concentrations of phytohormones etc. to induce specific growth patterns in that one can easily prepare a solution containing the desired amount of hormone, add it to the known volume of GM, and autoclave to both sterilize and evaporate off any solvent that may have been used to dissolve the often-polar hormones. This hormone/GM solution can be spread across the surface of Petri dishes sown with germinated and/or etiolated seedlings. Experiments with the moss Physcomitrella patens, however, have shown that choice of the gelling agent — agar or Gelrite - does influence phytohormone sensitivity of the plant cell culture. As an impression material in dentistry. To make salt bridges and gel plugs for use in electrochemistry. In formicariums as a transparent substitute for sand and a source of nutrition. As a natural ingredient to form modelling clay for young children to play with. As an allowed biofertilizer component in organic farming. As a substrate for precipitin reactions in immunology. Gelidium agar is used primarily for bacteriological plates. Gracilaria agar is used mainly in food applications. In 2016, AMAM, a Japanese company, developed a prototype for Agar-based commercial packaging system called Agar Plasticity, intended as a replacement for oil-based plastic packaging. ^ Oxford Dictionary of English (2 ed.). 2005. ^ Williams, Peter W.; Phillips, Glyn O. (2000). "Chapter 2: Agar". Handbook of hydrocolloids. Cambridge: Woodhead. p. 91. ISBN 1-85573-501-6. ^ Edward Balfour (1871). Cyclopædia of India and of eastern and southern Asia, commercial, industrial and scientific: products of the mineral, vegetable and animal kingdoms, useful arts and manufactures. Scottish and Adelphi Presses. p. 50. ^ a b Alan Davidson (2006-09-21). The Oxford Companion to Food. Oxford University Press. ISBN 978-0-19-280681-9. ^ Edward Green Balfour (1857). Cyclopaedia of India and of Eastern and Southern Asia, commercial, industrial and scientific... p. 13. ^ Shimamura, Natsu (August 4, 2010). "Agar". The Tokyo Foundation. Retrieved 19 December 2016. ^ Mary Jo Zimbro; David A. Power; Sharon M. Miller; George E. Wilson; Julie A. Johnson (eds.). Difco & BBL Manual (PDF) (2nd ed.). Becton Dickinson and Company. p. 6. Archived from the original (PDF) on 2012-06-06. Retrieved 2013-07-17. ^ Hopley, David (2010-11-26). Encyclopedia of Modern Coral Reefs: Structure, Form and Process. Springer Science & Business Media. p. 31. ISBN 9789048126385. ^ Payen, Anselme (1859) "Sur la gélose et le nids de salangane" (On agar and swiftlet nests), Comptes rendus …, 49 : 521-530, appended remarks 530-532. ^ Smith, A. (November 1, 2005). "History of the Agar Plate". Laboratory News. Retrieved November 3, 2012. ^ Hesse, W. (1992). Translated by Gröschel, D.H.M. "Walther and Angelina Hesse–Early Contributors to Bacteriology" (PDF). ASM News. 58 (8): 425–428. Retrieved 22 January 2017. ^ a b c d Lobban, Christopher S.; Wynne, Michael James (1981). The Biology of Seaweeds. University of California Press. pp. 734–735. ISBN 9780520045859. ^ Ewen Callaway (8 December 2015). "Lab staple agar hit by seaweed shortage". Nature News. Retrieved 22 January 2017. ^ Balfour, Edward. (1885). The cyclopædia of India and of eastern and southern Asia: commercial, industrial and scientific, products of the mineral, vegetable, and animal kingdoms, useful arts and manufactures. B. Quaritch. p. 71. ^ "Agar-Agar". Botanical.com. Retrieved 22 January 2017. ^ a b "III: Properties, Manufacture, and Application of Seaweed Polysaccharides - Agar, Carageenan, and Algin". Training manual on Gracilaria culture and seaweed processing in China. Food and Agriculture Organization, United Nations. August 1990. Retrieved 2011-04-27. ^ a b Rafael Armisen; Fernando Galatas (1987). "Chapter 1 - Production, Properties and Uses of Agar". In McHugh DJ (ed.). Production and Utilization of Products from Commercial Seaweeds. Food and Agriculture Organization, United Nations. ISBN 92-5-102612-2. ^ "All About Agar". Sciencebuddies.org. Archived from the original on 3 June 2011. Retrieved 2011-04-27. ^ Maeda H, Yamamoto R, Hirao K, Tochikubo O (January 2005). "Effects of agar (kanten) diet on obese patients with impaired glucose tolerance and type 2 diabetes". Diabetes, Obesity, and Metabolism. 7 (1): 40–6. doi:10.1111/j.1463-1326.2004.00370.x. PMID 15642074. ^ Agar-agar Review Sheet, USDA Organic Materials Review, April 1995. ^ Kim, Se-Kwon (2011). Handbook of marine macroalgae : biotechnology and applied phycology (1st imp. ed.). Hoboken, NJ: John Wiley & Sons Inc. ISBN 9780470979181. ^ Birgit Hadeler; Sirkka Scholz; Ralf Reski (1995). "Gelrite and agar differently influence cytokinin-sensitivity of a moss". Journal of Plant Physiology. 146 (3): 369–371. doi:10.1016/s0176-1617(11)82071-7. ^ about agar pre-embedding in histopathology . ^ "New Seaweed-Based Material Could Replace Plastic Packaging". GOOD Magazine. Retrieved 2016-04-03. ^ "Design Looks Ahead". Fast Company. Retrieved 2016-04-03.